Download 20 Bands in a Box III here ! Meringue Alcohol and Us's folk can be discovered on Pop Only Knows, with a track available for free download (the sensitive Little You) and, in streaming audio, a track from their next album (out in January 2009). Eleanor L. Vault's new ep, Rugs, is now available for free. 3 gorgeous folk songs that you have to download and listen. Fargo has finally decided to split after more than 2 years of great music. Sad news, and Pop Only Knows would like to thank them deeply for all they did for us. We already miss them. Tribecca triumphant live return December 19th. Friday December 19th, on the wonderful stage of the Paris Zèbre Tribecca will present a few new songs from their new album. Aside from Tribecca, the excellent General Bye Bye and the fiery Nothing Else will also be in the lineup. Tickets are on sale at 8 euros apiece. 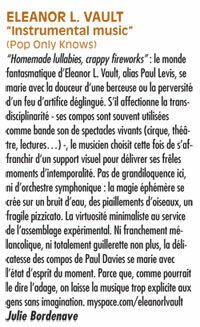 Eleanor L. Vault acclaimed in Longueur d'Ondes, a french magazine.